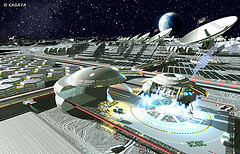 Lunar Settlement image credit: flickr/adpal3180 Below are frequently asked questions (FAQs) about Lunar Land Claims RECOGNITION, a legal framework proposed by the Institute that would create a powerful motive for private industry to invest in the development of Lunar infrastructure. The law would create a multibillion dollar financial incentive for private industry to pay for and develop an Earth-Moon transportation system and Lunar settlement open to all paying passengers. The consortium of private companies that first succeeds in building the space transportation system and permanent Moon base would, afterward, be able to claim a large area (about the size of Alaska) around their base. They could then sell U.S-recognized deeds to this land to people back on Earth to recoup their enormous up-front investment and reap a profit.